Last autumn I was invited to join an exclusive lake booking on Bluewater Lakes in the champagne region of France. For people who don’t know, I’ve never fished a commercial venue before and I tend to stick to the public canals and rivers of Europe. I was part of a six man group, we’d come armed with the Crave boilies and all of us were on the same bait. Everyone met at my place in the early hours of Saturday morning. We all had a cuppa and some biscuits, before hitting the road. We arrived at the lake without any hiccups on the way, 3 cars in convoy, with me leading with the only satnav! We had a draw, which I’ve never done before and being the fifth person to draw with only 2 balls left, I somehow pulled out number 1! 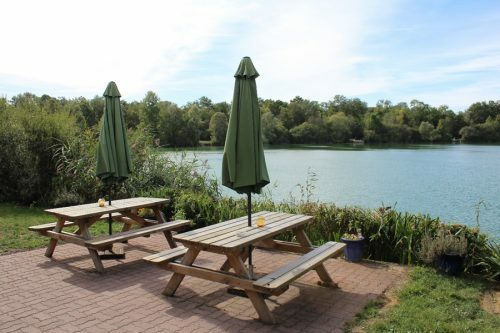 I chose what they call Lakeside 2 swim, the middle swim on the opposite bank to the lodge, giving me access to a lot of open water. On my first night I fished with a light sprinkling on boilies, but nothing occurred. I only witnessed a couple of fish show in front of me, but there was a lot of activity in other areas of the lake and a concentration of activity to my left in the deep corner of the lake. It was forecast to be dry with high pressure and with the news that around 25% of the lake stock had also been caught the week before our prospects didn’t look rosy. With the heat and high pressure I chose to fish a shallow bar of 9ft at 50 yards range. I placed 5kg of particles and boilies on the 2nd night and fished 2 rods on the bar. The 3rd rod I fished at another gravel seam at 70 yards with 1kg of Crave boilies only. I didn’t see a lot over the next 24hrs but on the Monday morning fish had eventually moved in front of me and were now showing and bubbling at range. I thought they would move in closer on the wind, but before nightfall they still hadn’t and it took me 3 casts with the marker rod to get to the right range at 85yards (they were feeding at 80 – 120 yards in general). I didn’t check the depth, they told me where they were feeding, and that was good enough for me. I placed both my baits off the far edge of a gravel strip, just as it went silty and Spombed out 3kg of particles and Crave boilies (washed out for 48hrs) over two spots. I also left one rod on the 50 yard spot. Finally I received my first run just before midnight on one of the long rods. After a bit of a song and dance getting into my waders, I then had to limbo under my other two rods as the fish had kited past both of them, it didn’t get tangled as I was using backleads and she slipped into the net on the first attempt of asking. 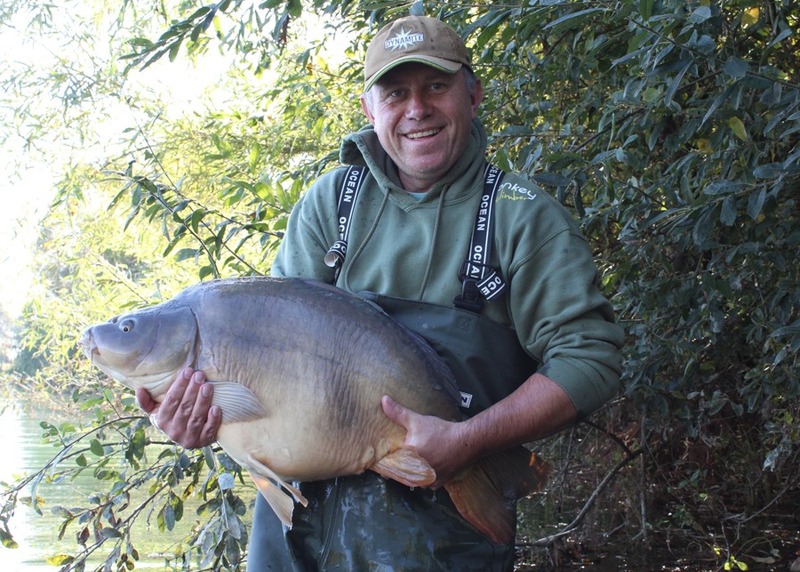 A mirror of 39lbs on the button, I was over the moon, my first French commercial carp. The fish fell to a 18/15mm snowman rig, 18mm Crave bottom bait and 15mm pink Crave pop-up. When going abroad I tend to stick to very simple rigs. The other long range rod ripped off just after lunchtime, and this fish felt heavy and was putting up a much better fight than my first fish, the fish boiled on the surface after a several minutes and I knew it was a big fish, 50lb+ easy! The fish slipped out the net on the first attempt, but finally dropped into the bottom of the net on the second attempt, and I could breathe at last! With a member of the party looking after the fish in the net, we got everything ready for photos, I had a quick look, it was a short and deep fish and thought maybe it was an upper 50. With everything ready, my two glamorous assistants hoisted her up onto the mat, and they doubted my 60lb scales would do, and they were right, so I had to rush and get my 120lb scales and zero them to the wet weigh sling. All zeroed and double checked, I put my foot against the bottom of the weigh crook and lifted her up above the mat, with me behind the scales, they said 70lbs, both confirming and then re-confirming, yes 70lbs on the button, wow wow wow! There is (was) only 1 fish over 70lbs in the lake, Miggsy going 75lbs on her biggest weight, and coming out recently at 68lbs, so we thought it must be her, but after Jim & Jan the lake owners checked the photos later that day, it was confirmed as a fish called ‘Pears’, it’s previous best weight of 69.14lbs, so two ounces up on her last autumn weight. I didn’t care, 60 would have been good enough for me, but the scales read what they read. She is a very old fish, and was tired and took some nursing before she kicked her tail and slowly swam down into the murky depths of Bluewater. I Spombed out another 3kg of bait to the long spot, even though I was told it doesn’t work here, it scares the fish off. That night I chose to place all 3 rods long, and left the closer in spot free of any lines or rigs. I saw a few fish showing and fizzing over the baited area the following morning, but it took until late morning to finally receive a bite on the middle rod. 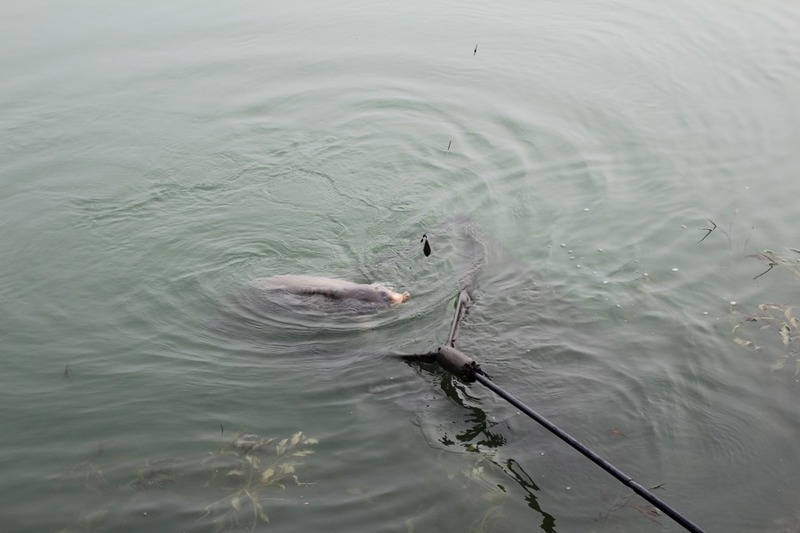 No matter what I tried the fish kept heading for a patch of potamogeton weed just out to my right, my line was nearly slack and limp on a couple of occasions, as I just held the line but did not pull. I dropped the rod tip low and managed to get the fish round the left hand side of the weed a lot easier than I thought it was going to be, It made a couple more attempts at reaching the weed, but I stopped it from doing so, and soon had another fish in the landing net, this time just over 35lb mark. All morning I had been watching fish show and fizz over the bait on a bar at 50yard range, as if they knew there was no rig out there. That evening I chose to place 2 rigs long, and 1 short again, and topped up each spot with about a kilo of bait. 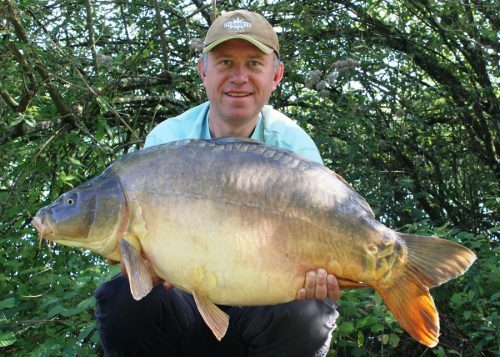 As was becoming the pattern, I was kept up most of the night, as it sounded like people were dumping fridges in the lake, but was actually massive carp crashing out in the quiet still nights. Again the following morning fish were showing over both areas, I was watching a fish feeding on the close bar through my binoculars, thinking to myself, that’s got to be bang on the spot, when bleeeeeeeeeep I was finally away in the close spot. The fight didn’t actually last long and I soon had a 30lb carp in the net. I returned the fish, then waited for the activity to dissipate for me to wind the rigs in and top-up the spots with some more food, and then get them back out for the night ahead. On inspection both the hooks on the long rods were blunt as a nail, which would explain the lack of a run. I had experienced a lot of small lifts, knocks and the odd liner during the night, I can only assume it was silver fish on the small particles moving the hooks around. The last 48hrs of the trip was very quiet, and the activity over both areas had reduced to just the odd show and fizzing, nowhere near the intensity as earlier in the week, they had moved, and I should have moved with them. Still 4 fish, 4 days on the trot for my first visit is not too bad when considering the conditions. As we say we’re always learning, and I will be storing that in the memory banks for any potential future trips to the lake. Jim & Jan who run the lake have really got the setup perfect, from the lodge and all the facilities, to the swims and track around the lake, and of course the huge fish, swimming under the surface of Bluewater. This summer I will be taking the new CompleX-T range to the Great Lake on the Goncourt complex with all those stunning big fully’s in the lake. I’ve wanted to fish this lake for a long time, I cannot wait to drive up to the lake and see it for the first time with my own eyes.